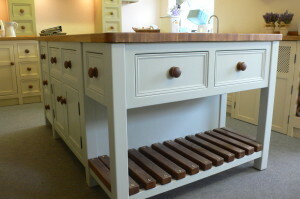 A lovely kitchen freestanding island stuffed full of storage. 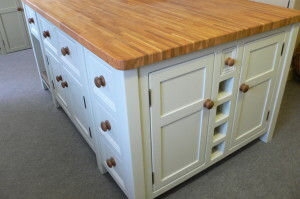 This island has everything, loads of deep cupboard storage, plenty of drawer space, there is even a row of wine bottle holders with a tiny corkscrew drawer above. One end has a slatted wooden base-perfect for large pans, jugs or baskets. 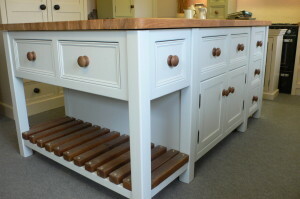 Painted in farrow and balls ‘pale powder’ with a 27mm pine worktop (this is stained then coated with layers of waterproof wax so making it durable), with matching wooden knobs. 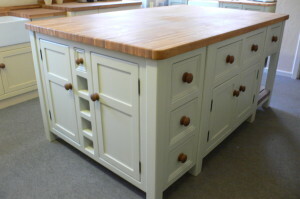 If you wish to upgrade to an oak worktop add £229.00,delivery is free within 250 miles.Please note this unit will come in three smaller sections and final assembly is not included.